It was one year after I graduated from high school that I experienced an infusion of passion for Jesus Christ. He took me from nominal (lukewarm) Christianity to a fiery, passionate faith that I could not keep to myself. I was consumed with zeal for Christ and His interests and my life would never be the same. I enrolled in Bible college so I could know His word. I evangelized almost everywhere I went. Even my “art” became my primary means of engaging in “at-home” missions. Hip hop provided a perfect opportunity to “spread everywhere the fragrance of the knowledge of him” (2 Cor. 2:14). Like Paul, truly to live was Christ and to die was gain (Phil. 1:21), and I knew that all of me was set apart for Him. 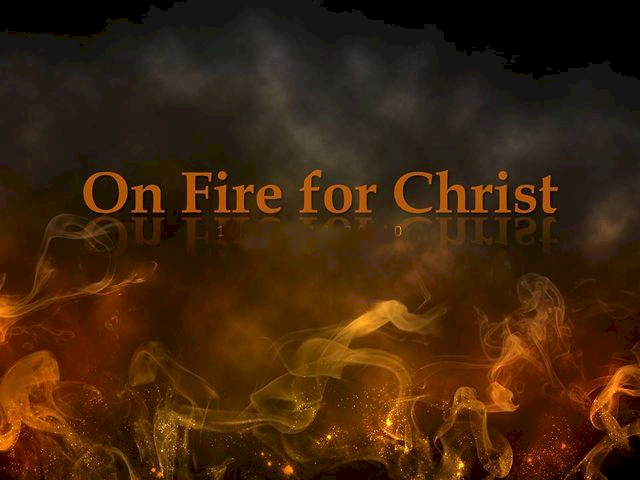 Admittedly I could be a little “over-the-top” at times but it was clear—I was on fire for Jesus! “The glory of his name,” “the success of His cause,” “the prosperity of His people”… these are our compelling concerns. They are so weighty! Not “our name” but “His name.” Not “our cause” but “His cause.” Not just “ourselves” but “His people” are the matters for which we will preach, create, suffer, lose, labor, and strive. Indifference is not an option and silence is too difficult. Like Jeremiah the prophet, “If I say, ‘I will not mention Him, or speak any more in His name,’ there is in my heart as it were a burning fire shut up in my bones, and I am weary with holding it in, and I cannot” (Jer. 20:9). Zeal pulls otherwise easy-going people into the battle and this is why believers were given the Holy Spirit. The boldness needed to respond zealously as a sheep among wolves takes power from on high. In Christ we have that Spirit, and in Him we have that example. Let us fan into flame the gifts given by the Spirit (2 Tim. 1:6). I can honestly say that lately these things have been consuming me in a renewed way. Even my own sin and my own worldliness bothers me because they impede my ability to be singularly devoted to these passions. Grace is amazing and the Spirit is with us. I know I’m not alone. That’s why I’m re-engaging in a two-sided ministry of the gospel. I plan to proclaim Christ to the culture, while loving and laboring with my family in Christ in full view of the on-looking culture. Through music, preaching and teaching, writing, and prayer, I hope to be the ambassador that God has called me to be. As His ambassadors, let’s standup and represent! Keep your brother in prayer. Grace and peace. Great article bro. I needed that. I Thank God for your ministry and diligence. Great word bro’! I’m with you on that. I have the same prayer and desire. Thank God for His faithfullness! I want to be consumed by Him! Praying for your success in that area. Peace. Glad to hear that bro, been waiting to hear you operate in the fullness of your gifting. The body needs it do allow the enemy or even your own Heart to discourage you. God is greater than both, the Cross speaks louder of God’s love for you. I’ve been waiting to hear this for years. We are praying for you fam, hope one day to be able to chop it up with you. Grace and peace. On point for sure. I was just talking early to a young brother in the faith about this very thing. He mentioned having a renewed vigor/fire. I too can concur. Im excited for your ministry and the things to come but also for the body as a whole. We together ablazed making the name of JESUS famous. May GOD richly your family and your ministry. Your leadership is sorely needed as the banner of Christian Hip Hop is being waved widely and embraced broadly. Duce.0, our sole purpose is to do His will, once we realize that truth that zeal becomes natural. Yeah we have the enemy trying to steal, kill and destroy us but that’s when we press sin and press on in the Lord. I love that natural vigor of the Lord not manipulated and worked up. That’s where a lot christians get it wrong, we start doing things because it’s how the world operates. It teaches us when and when not to. Instead of truely being lead by His Spirit. Grace and Peace Man of God!